Shell Beach is located around forty five kilometers south-east of Denham. This is the best place you can visit during your vacations to Carnarvon. It is a marvelous pearly white sand beach that is made up of thousands of small shells extending up to 120 kilometers. These shells were once used to build office walls of buildings located close to this area. You can also visit a few interesting buildings here and check out those walls as well. If you get a chance to visit Shell Beach on a calm day, you will be surprised to see how it will transform into a palette of greens and blues. 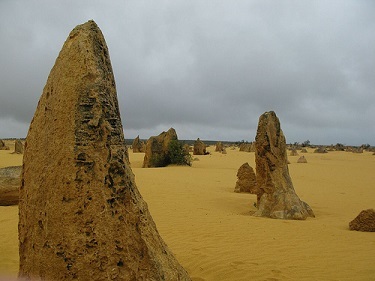 A visit to The Pinnacles is a must for those who visit Australia. The incredible collection of limestone formations are something which you will never forget in your life. These protrusions are unique and one of their own kinds in the universe as they stand at almost three meters tall. When planning a trip to The Pinnacles, make sure you visit during spring as the local wild flowers begin to bloom and offer a breathtaking contrast between the colorful flowers and the dry desert. You will certainly not regret a trip here as it is an ideal place for the adventure seekers and the families at the same time. Blowholes are just a phenomenon of the sea splashing through holes and making gushing out geysers like whales do with their heads. The tourists really like the blowholes here, as the clear water and white foamy waves shoot sprays through blowholes and make swooshing noises. The large gush of water at the back of red rocks produces a contrasting beauty. The Eagle Bluff is an ideal place for snorkelers and divers alike. It is better if you plan to visit this place around the hours near sunset. You will get a chance to witness one of the most amazing sunsets in the west. In the evening, you can enjoy a long walk with your family and enjoy the breathtaking views out across the water. You trip to Eagle Bluff would be incomplete if you do not get a chance to dive into the water and see the abundance of coral and fish in this stretch of water. Consider yourself lucky if you manage to see sharks, dugongs and dolphins. There are many people who prefer to set a camp there and enjoy a peaceful night with their friends and families. Visit these attractions today and when it comes to accommodation in Carnarvon, you need not worry as there are many quality yet economical choices around so that your trip here will certainly not break the bank!